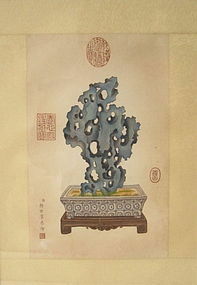 A refined Chinese painting of a Taihu scholar rock set in a planter like object on a stand. The work is attributing to the Italian Jesuit Painter, Giuseppe Castiglione or Lan Shining in Chinese (1688-1766). Shows age but most likely 20th century. Size: Length 20.75" Width 15.78"